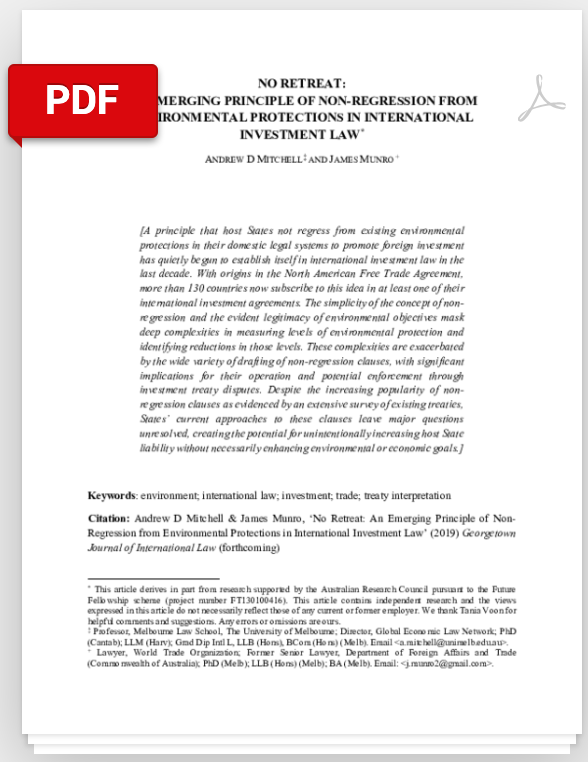 ABSTRACT - A principle that host States not regress from existing environmental protections in their domestic legal systems to promote foreign investment has quietly begun to establish itself in international investment law in the last decade. With origins in the North American Free Trade Agreement, more than 130 countries now subscribe to this idea in at least one of their international investment agreements. The simplicity of the concept of non-regression and the evident legitimacy of environmental objectives mask deep complexities in measuring levels of environmental protection and identifying reductions in those levels. These complexities are exacerbated by the wide variety of drafting of non-regression clauses, with significant implications for their operation and potential enforcement through investment treaty disputes. Despite the increasing popularity of non-regression clauses as evidenced by an extensive survey of existing treaties, States’ current approaches to these clauses leave major questions unresolved, creating the potential for unintentionally increasing host State liability without necessarily enhancing environmental or economic goals.